Maxar Technologies is in a precarious financial position, a result of its highly levered balance sheet and an on-orbit satellite failure. Shortfalls in expected earnings and a pending step-up in capex are making a bad situation worse. The common stock could be crushed by the force of the leverage or if management can walk the tightrope, they may deliver large % gains to shareholders. This is a very high risk stock. The safest place to be in the capital structure is a buyer of the debt - a position only available to institutions. Debt finance is referred to as leverage for a reason - it acts as an amplifier of input forces on the business. If the input force is good - increased earnings, reduced capex, lower taxes - then leverage delivers an amplified improvement to shareholders' position, all other things being equal. Similarly, if the input force is bad - reduced earnings, increased capex, increased taxes - then leverage delivers an amplified hit to shareholders. If the input force is very bad, the amplified output force of financial leverage can be crushing to shareholders. Leveraged finance isn't complicated, although many people like to portray it as such. If you can understand a mortgage, you can understand leveraged finance. Being a shareholder in a leveraged business is just like owning a home with a mortgage and then renting out the home. You make a downpayment (equity), and you take out a mortgage (a leveraged loan) to cover the rest of the purchase price. In order to keep hold of your equity, you have to make interest and capital repayments to the lender, else the lender will seize your equity and with it your asset, and leave you with nothing. So you aim for the rental income (after taxes and repairs and all your other costs) to at least cover the costs of the loan, and ideally pay it down too. And you hope that you can increase the rent as time goes by so that some of the rental income is left over after servicing the debt. Finally, you hope that the housing market rises such that any additional value obtains to your equity (because the loans are absolute amounts, and don't rise or fall with the market). Leveraged companies are exactly the same. The capital structure consists of equity (common and preferred stock) and debt (leveraged loans). The debt comes in different flavors with fancy names such as Revolving Credit Facility, Term Loan, Bullet, Amortizing Facility, Capex Facility … but it's just debt, whatever the name. As an equity holder in the business, you aim for the cash flows to service the debt and hopefully pay it down. And you hope that cash flows rise over time so that cash flow is left over after paying for the debt. And you hope further that the market rises so that any additional value obtains to your equity, just like your house that you rent out. The best kind of house to mortgage and rent out is one in a good neighborhood in good condition that attracts a premium rent that can be increased every year and that doesn't cost much to fix every year. And the best kind of business to lever is one with earnings growth, pricing power, and low capex. The worst kind of house to mortgage and rent out is one where you can't always find a tenant, that keeps breaking so you have to keep paying plumbers and electricians to fix it, and where your bank has sold your mortgage to a fund who keeps trying to find ways to seize your home. And the worst kind of business to lever is one that has a small number of possible customers, high capex, single points of failure in the business model, and where the bank has sold the loans to funds who keep trying to find ways to seize the business. Maxar Technologies (NYSE:MAXR) is a business which isn't well suited to leverage. It has relatively few customers (the US and Canadian governments represent half the revenue), is prone to single points of failure in its revenue line, because it depends upon a small number of monolithic satellites to deliver that service, and has structurally high capex because it needs to continually refresh and replace its orbital fleet of satellites. In 2018 the situation reached breaking point when one of its large satellites failed, taking away some c.$45m of EBITDA and cash flow, approximately 10% of group EBITDA and a higher still % of cash flow. These inputs, amplified through the leverage, crushed the stock price from a high in the mid-$60s/share down to the current level hovering between $4-5/share. As we observed in our recent note on Maxar (Maxar Technologies - The Risks Of Incumbency In The New Space Race), the leverage risk carried by the company hit hard when its WorldView-4 satellite failed in January this year. The spacecraft became immediately unproductive and with that approximately 10% of EBITDA and a third of free cash flow ceased. For a company that by our workings stood at 6.2x LTM EBITDA of leverage at the end of 2018, that is a very difficult place to be. 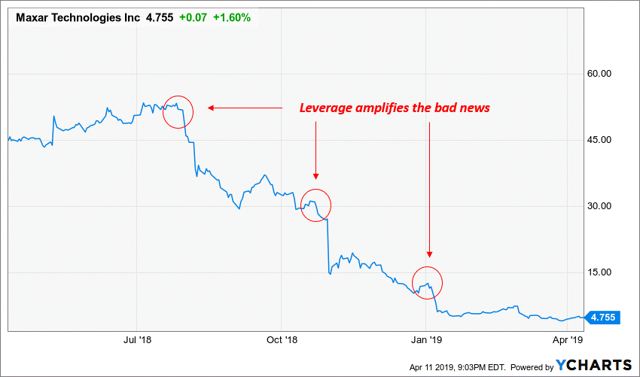 (By way of calibration, until very recently, the SEC imposed a maximum amount of leverage of 6x EBITDA - and that was on leveraged buyouts led by private equity firms, not public companies. 6x is a lot of leverage). MAXR's earnings report for Q4 2018 focused on the sustainability of the business going forward, explaining the debt obligations and so forth - it didn't talk up the earnings or cash flow growth going into 2019. You can read the presentation here. Post earnings, the stock price depression persists, with the stock currently trading in the range of $4.20-$5.00/share, representing a market cap of in the range $250m-$300m, but an enterprise value of $2.7-2.8bn once the net debt position is included. There has been much speculation in the investor community as to upside in the stock, with many investors anticipating a rapid recovery in the stock price. We post our analysis below. In short, we think the outcomes from this point are likely to be extreme. Either the company stays afloat despite its cash flow being drained to service debt - in which case we would assume rapid % gains in the stock from say Q4 19 / Q1 20 - or the company is pulled down by the debt obligations, in which case we would suggest that bankruptcy protection could very well be the order of the day. We think it unlikely that the stock just bumbles along making small gains or losses. Here's how the situation looks to us. We've pieced this analysis together from the company's 10-K, and the conference call transcript following its Q4 earnings. We don't claim our numbers are accurate to two decimal places, nor even to the nearest $1m - it cannot be, since the company has not been specific about, for instance, the 2019 EBITDA of a business unit that had negative $85m EBITDA in 2018 - so we have had to make some guesses. But even if our analysis is out by +/-$20m, we would reach the same conclusion. 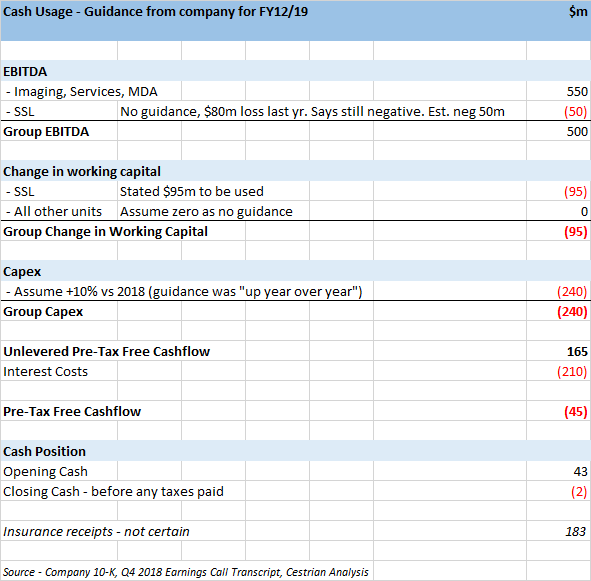 And now the cash flows going into 2019 - note there is a lot of judgment in this analysis because the company has not provided much in the way of guidance. What this analysis says is - that more or less all the pre-tax cash flow the company will generate in 2019 will go to pay interest costs on the debt. In fact, our analysis suggests that the company could use all its pre-tax cash flow and all the cash it has on its balance sheet to service its debt in 2019. The company believes it will collect $183m in insured damages following the failure of its satellite in 2018 - that may be the case - it is the only substantial source of cash that we can see - but until it's in the bank, it's not in the bank and we assume insurers will be doing very detailed work to see if they are in fact liable for such a large amount. We think this puts the company in a very risky position. Our regular readers will recall that our focus is on long-only, equity-only strategies. We are happy to consider short-term trades and long-term holds within this long-only, equity-only approach. We cannot in all conscience rate MAXR at anything other than Neutral right now - for us the risk is simply too great to justify the possible upside. That isn't to say that investors willing to swing for the fences might not make very good money here - bravery could well be rewarded. But we're on the sidelines for now. Over and above the raw facts of the cash flow versus the leverage, the other reason we are at Neutral is because we don't know the makeup of the loan syndicate. Going back to our mortgage analogy at the top of this note - when companies take out leveraged loans of any size, they usually borrow the money from an initially small number of banks or funds - say 2-4 lenders for loans of the quantum taken out by MAXR. These banks and funds then syndicate - sell - the loans they hold, in order to lay off the default risk and manage the size of their loan book. So within say 12 months after a leveraged loan is first arranged and drawn down, there could be 20-30 holders of pieces of those loans. And very often the holders won't have any ongoing relationship or expectation of future business with the company that took out the loans. So there is no concern about reputational damage or another jeopardy if such loan holders seek to 'enforce' or 'accelerate' the loan. These are fancy words for … demand repayment due to a breach of the loan terms … and if repayment cannot be made … find ways to take a piece of the company's equity. Leveraged loan contracts are usually documents extending to several hundred pages. Most leveraged companies are in breach of one or another term amongst those several hundred pages - if only they cared to look. Most times it doesn't matter because it's a minor breach that can be remedied and because the lending syndicate owns a performing credit that it doesn't need to agitate over. But once a credit becomes non-performing those minor breaches can become major - because they cannot be remedied with a one-time payment or some other salve. This way, small eddies in the loan documents can lead to material changes in the equity ownership of the company. 'Loan to own' behavior by credit funds is perfectly legal and legitimate - many such funds have large numbers of staff whose job it is to find breaches in loan documents in order to take advantage of their position. Again - it's called leverage for a reason. We don't know what MAXR's loan syndicate looks like - but we doubt it is entirely made up of friendly institutions that wish the company well. We would imagine there are some tough cookies in the capital structure at this point - and that represents stored-up trouble for the company. Fending off an aggressive lender eats management resource and eats legal fees - two things the company can ill afford right now. 1. Retain a top leveraged finance law firm if you haven't already - and get the leading partner on your account. Then have them read every page, paragraph, word, comma and full stop in all your loan documentation and shore up your defenses. The biggest risk to the business right now is the one you may not have met yet - it's a determined and aggressive loan-to-own debt trader. When you took out your loans, you probably dealt with a 'relationship bank' as the lead lender and syndication agent. They probably reassured you that they would be there for you if things went wrong. They probably meant it. However, since you took out those loans, the syndication desk will have likely sold the loans piecemeal to other banks and debt funds cast far and wide. You probably don't need to worry so much about the banks in the syndicate. You probably DO need to worry about some of the funds now in the syndicate, because their business strategy is different to your relationship banks, as we explain above. 2. Initiate a drawdown of cash on your revolving credit facility - just to see if it is in fact available. You rightly think this is cash on tap that you can access when you need it. You should check that's the case. Draw down a material amount of cash, then repay it, just so you know the facility is there if you need it. Best to find out there's a problem now if that's the case - then you have time to fix it, versus trying to draw down when you really need it only to find there are snags and delays in obtaining the cash. 3. Do everything you can to not sell receivables at a discount - this is a risky strategy for a highly levered company. We know you may have to factor the orbital receivables - if you have to, you have to. But that is giving away money that would better be used to service the term loans. Avoid if at all possible. Nobody wants to hear this, nobody wants to do it, but it may be better to be out front and take the pain (and shareholder abuse!) now rather than if you have to restructure equity at a time not of your choosing, such as in bankruptcy protection. You might consider raising equity from a private equity firm that is able to invest in public companies - not all can, so be selective. That will bring with it very deep experience of dealing with the leverage problem you have before you. 6x leverage isn't as scary to a private equity firm as it is to a mutual fund. 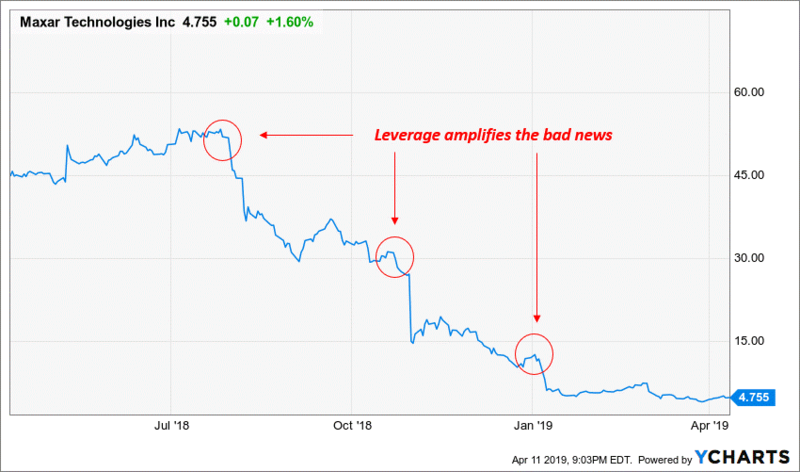 And further, a private equity fund is a repeat customer of loan markets, meaning the lenders in your syndicate have a lot more jeopardy at stake if they are dealing with a repeat customer PE fund vs. a one-time customer public company. Bring a senior exec from the PE fund onto your board and have them deal with the loan syndicate, freeing up management time to run the business. We salute MAXR's dividend cut, cost restructuring, pursuit of insured damages, and the energy its new CEO will bring to the table. We hope the company prospers and restructures its capital structure to the benefit of its shareholders. The failure of their WorldView satellite was a bolt from the blue that came at an already difficult time and this is a big challenge to work through. We wish the management team well. We will be continuing coverage of MAXR for earnings and regarding any material event.